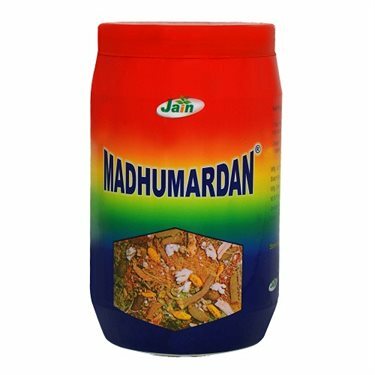 Madhumardan is a time tested holistic, comprehensive formulation of 32 ingredients (including Mineral Pitch and purified Pearls) with synergistic action on Diabetes and the complications arising out of it. It not only reduces elevated Blood Sugar but also is a tonic for Diabetics. The most important assertion is that it is totally free from Metallic Bhasmas. Madhumardan contains food supplements and is 100% natural and hence does not cause any side effects, instead it has additional benefits. It can be taken along with other anti diabetic medicines. It does not cause the sudden fall of blood sugar level and is safe, tolerable and acceptable medicine. It shows slow and steady action on Diabetes Mellitus and its Complications.